Luis Colan was born in Lima, Peru in 1980. He credits discovering his passion for painting after experiencing the religious festival, El Señor de los Milagros (Lord of Miracles), as a small child. From then on he has taken inspiration from the beauty he sees in every day life to create his work. At age ten he and his family moved to Connecticut, where he continued his education from middle school through college. 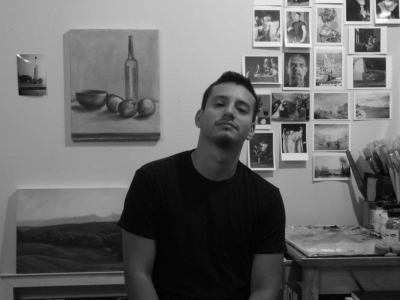 Attending the Hartford Art School, at the University of Hartford, Luis was influenced by artists and professors Stephen Pat Brown, Fred Wessel, and Jeremiah Patterson. It is from these mentors he learned new techniques and color theory that pushed his work further. While at the Hartford Art School, Luis was introduced to abstraction under the guidance of professor Pat Lipsky. During the short period of experimentation with abstraction he was able to further explore color and the physicality of oil paint. After graduating in 2004 Luis moved to New York City, where he currently lives and works. It was at this point when he returned to still life paintings, exploring new techniques and styles. Cocina de Mama, his first solo show in 2010 through Woodward Gallery, featured a collection of still lifes of food he grew up helping his mom prepare in the kitchen. Luis has continued his education by taking classes at the Art Students League and the Teaching Studios of Art in Brooklyn, both schools have exposed him to the teachings of Dan Thompson, Adam Miller, Robert Zeller, and Bennett Vadnais. Working closely with these artists has allowed him to refine his ability to depict landscapes and figures. Partaking in numerous events and workshops, including Plein Air workshops in Tuscany in 2013 and 2015 has allowed him to continue to develop his vision as a landscape painter. He has been exhibiting in New York and surrounding areas in several group shows, three solo exhibitions, and in 2010 became a Junior Member at the Salmagundi Club where he remains active and exhibits continuously.